Fatta Nahab, MD, is a board-certified neurologist and director of the neuroimaging program at UC San Diego Health’s Movement Disorder Center. Find out how he is using innovative brain imaging techniques to reveal clues in understanding and developing new therapies to treat movement disorders. He explains about “white dots” in the brain and how they are good predictors for walking problems, and not only in Parkinson’s patients. Walking is one of the most complex systems the brain controls. Many people assume as they get older they will have problems with walking due to arthritis and other factors associated with aging, but that’s not exactly what he found. The brain plays a significant role in walking problems, more so than sore knees. 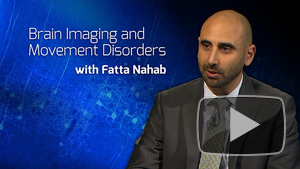 Watch Brain Imaging and Understanding the Pathogenesis of Movement Disorders with Fatta Nahab.